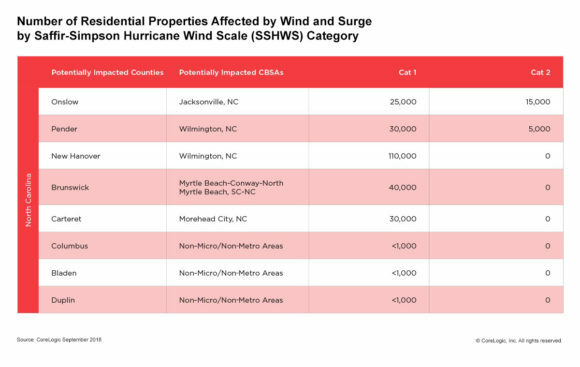 Torrential wind and storm surge from Hurricane Florence could cause between $3 – $5 billion in insured residential and commercial property losses, according to CoreLogic, a global property information, analytics and data-enabled solutions provider. The new estimate doesn’t include insured losses related to rainfall, riverine or other flooding since the full rainfall footprint is an element in factoring total losses. Hurricane Florence is expected to make landfall along the North Carolina and South Carolina coasts. In particular, 250,000 homes in North Carolina are projected to be affected by the hurricane. The following numbers have been refined based on the September 13, 8 am PDT National Hurricane Center (NHC) track of the storm and the cone of uncertainty. The table above shows the estimates for commercial and residential insured property losses by state in North Carolina and South Carolina. National Flood Insurance Program (NFIP) inland flood losses are not included (only storm surge related NFIP flood losses), since it is too soon to tell what the potential rainfall, riverine, and other flooding will amount to in order to tabulate losses for that peril. The number of residential properties indicated in the table above does not consider inland flooding. As Florence moves over land, it is expected to weaken, so some counties won’t experience the full impact of a Category 2 hurricane. This is represented in the table as zero values. Certain counties will experience both Category 1 and Category 2 impacts because the properties closer to the coast are likely to experience stronger winds relative to the more inland properties. In particular, it is expected that South Carolina will not exceed tropical storm force winds based on the projected track and is therefore not included in the table. The table above shows the insured property loss estimates for past storms in the Carolinas if the events were to occur today with the current property exposure. These storms are not the same as Hurricane Florence; they have different track trajectories and landfalls. However, like Hurricane Florence, these storms were also Category 2 storms at landfall. These events are comparable to Florence in terms of their wind impacts. However, the storm surge losses from Florence are expected to be significantly greater. The table does not include a measure of inland flooding losses. For major Gulf and Atlantic Coast hurricanes that impact the U.S. this year, CoreLogic is planning on providing pre-landfall data for the number and associated reconstruction cost value (RCV) of at-risk homes as well as a secondary set of pre-landfall data for estimated insured property losses for wind and storm surge. For post-landfall data, CoreLogic plans to issue insured and uninsured property losses for wind, storm surge and additionally flood. Visit the CoreLogic natural hazard risk information center, Hazard HQ™, at www.hazardhq.com to get access to the most up-to-date Hurricane Florence storm data and see reports from previous storms.